Chai Jing is an excellent investigative journalist who made the internet documentary ‘Under the Dome’ which has been watched by hundreds of millions of people around the world, including 150 million just on the Tencent channel in China in the three days before the Chinese authorities panicked and stopped Chinese viewers seeing it. However it can still be seen in the rest of the World. The version I watched was one hour 43 minutes long. Chai Jing investigates Chinese air pollution, the damage this does to human health and how tightening environmental standards can lead to economic growth. She does not cover Climate Change and the possibilities renewables offer. Clearly the polluters should be made to pay. A recent IMF study shows that if the externalities of production (health and climate) were included subsidies to the global fossil fuel industry could be worked out to be $5.3 trillion per annum. These figures will be challenged, but of course they could be an underestimate, and anyway they include factors that are simply beyond monetary value. On a dead planet there is no economy to worry about. Our car sharing club bought Volkswagen cars on the understanding that they had the lowest emissions of any car that we could afford. We feel cheated. Volkswagen’s emission cheating software has cost them dearly. They’ve already lost their place as the World’s largest car maker and have lost $30b from their share price. Meanwhile Shell have pulled out of the Alaskan Arctic at a cost of $7b and abandoned the Carmon Creek tar sands project in Alberta, loosing another $2 billion. Mass bankruptcies are causing chaos in the fracking industry. The global disinvestment movement is gaining traction, just as the falling price of energy is creating vast stranded assets in the fossil fuel industries and the cost of renewables continues to decline. A couple of days ago there was a very interesting article in the Telegraph by Ambrose Evans-Pritchard. The old energy incumbency and the politicians and agencies they have influenced have got things wrong. The disruptive impact of renewables and efficiency has been massively under estimated. 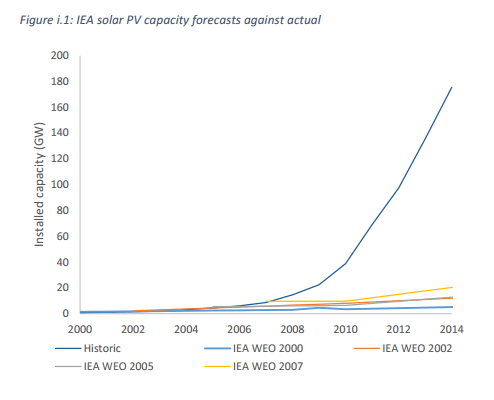 The graph above shows how the International Energy Agency failed to see how dramatically solar pv would expand. As the Global Cleantec industry gains influence its interests coincide with those of everyone who cares about pollution in all its forms. More and more people are beginning to understand that we can tackle climate change and pollution generally while providing all humanity with a good standard of living. Given the nature of Global capitalism this will be a chaotic process as disruptive innovation sweeps away old polluting industries. 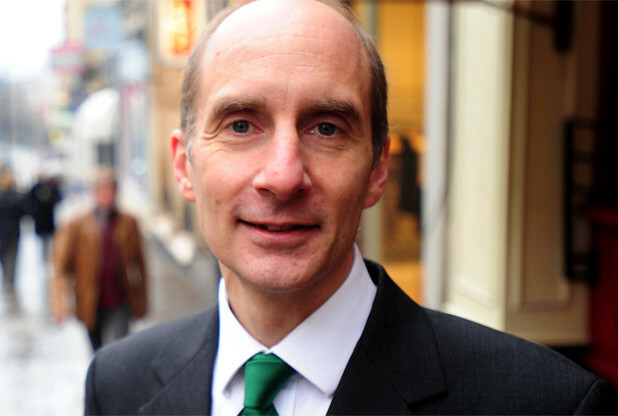 Hundreds of millions of jobs will go, just as hundreds of millions of jobs will be created. The inevitable social damage could easily be mitigated if we all had Scandinavian style governments, but that’s for another blog. The important points to note are that the tide of history is swinging towards a Cleantec revolution, a strong agreement in Paris to reduce emissions is a necessary part of the process to prevent Climatic catastrophe and that the economic benefits should be greater than the costs, especially if the transition is well managed. This entry was posted in Energy, Environmental on 31 October 2015 by Richard. The United Nations Climate Change Conference will take place in Paris from 30th November to 11th December. The task before the politicians is immense. Humanity must reduce CO2 emissions very rapidly if it is to survive. The only known safe future lies in getting atmospheric CO2 back below 350 ppm (parts per million) as quickly as possible and then to return to the long term historical norm of 285ppm, the level which provided humanity a climate in which it has flourished. Levels are now at 397.64 and still rising at about 2ppm per year. 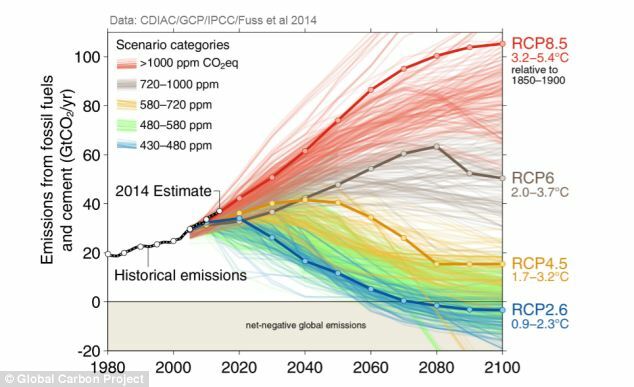 The graph shows various scenarios of possible future emissions. Essentially the red scenarios are game over for humanity. The grey and yellow scenarios would still entail billions of climate refugees as rising seas flood low lying land, deserts replace arable farmland and climatic patterns become dangerously unpredictable. Only the green and blue scenarios are somewhat more hopeful. However what would be best is for humanity to be able to reach net-negative emissions by 2040 or 2050, which is a more radical scenario than any of those represented here. Such radical and rapid reductions in emissions are theoretically, technologically and philosophically possible. Political will is overwhelmingly the greatest stumbling block. The fossil-fuel incumbency is still fighting tooth and nail to keep polluting. We see this in Volkswagen cheating emissions laws, Australia allowing the Carmichael coal mine or George Osborne’s attacks on renewables and energy efficiency: such bad actions cumulatively threaten humanity’s future. However the arc of history is firmly bending towards a better future. Those of us arguing that a low carbon renewables based economy is necessary, possible and desirable were once a tiny minority: now we are the huge majority. A tidal wave of opinion is flowing our way: the Papal encyclical, the statements of Mark Carney (governor of the Bank of England) and Jeremy Leggett’s ‘Winning the Carbon Wars’ are a few of the millions of examples of this tide. The Paris talks will be a major battle in the Carbon Wars. At which point the scales tip irrevocably toward climatic catastrophe or toward something better will only become evident in retrospect. We have much to do to get emissions to stop rising, to decline and to enter the net negative zone and then eventually to stabilize the atmosphere, probably back at the pre-industrial norm of 285ppm. 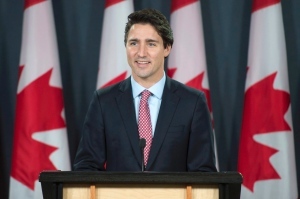 This entry was posted in Climate Change, Energy, Environmental, Global, Politics on 16 October 2015 by Richard.